Ropa Vieja has long been one of my favorite Latin dishes. 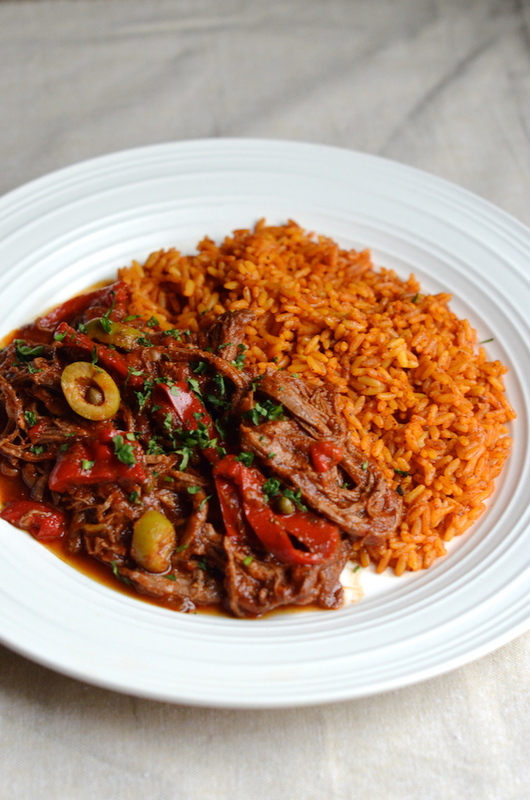 It's a classic Cuban dish made from slow-cooked shredded flank steak stewed in a savory broth of tomatos, peppers, herbs, and spices. It's savory and flavorful, without being spicy, and is absolutely wonderful served over rice with sweet plantains or creamy avocados on the side. The name "ropa vieja" is Spanish for "old clothes." The idea being that the shredded meat is supposed to look like a pile of tattered old clothing. An admittedly weird, and unappetizing simile, but it's so good so I'll forgive it. The other thing I love about it is that, despite the incredible, complex flavor, ropa vieja is actually one of the easiest dishes ever to make. You really only have to combine a bunch of ingredients in a pot and let the stove do all the work. About 31/2 hours of gentle simmering, and the dish is ready to serve. No babysitting, stirring or even much prep work required. While most recipes require that you brown the meat and saute the ingredients in steps, I've never felt that those extra steps were really necessary. I literally just put everything into the pot, and let it go. It's much easier and the final dish is still so rich and flavorful, all the while saving you extra time and clean-up. 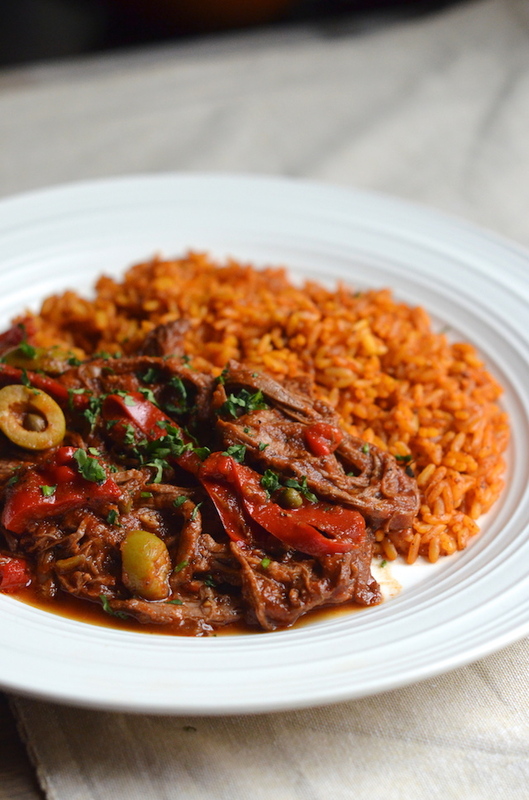 Ropa vieja is also one of those recipes that can be made a couple days in advance. In fact, it's often even better when allowed to rest overnight in the fridge. With increasingly colder days upon us, this cozy comforting dish is one that you should definitely add to your repertoire. P. S. If you like this recipe, you should also try my Cranberry Ropa Vieja, which is absolutely perfect for fall! 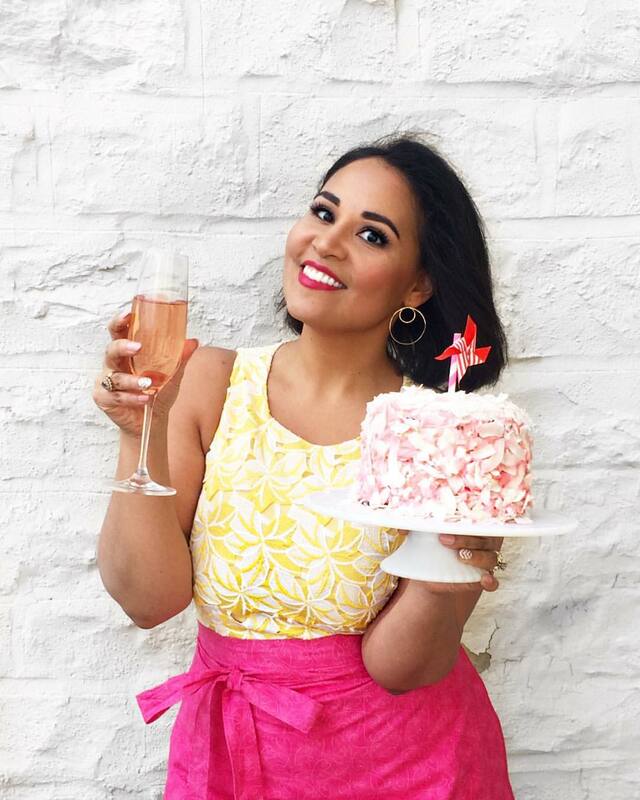 P. P. S. Want more Latin celebration recipes? Check out my eCookbook: The Puerto Rican Christmas Table with 40+ recipes and full-color photos. Click here to learn more! Place a heavy-bottomed pot or dutch oven over medium heat. Add the oil and sauté the onions and peppers until soft. Cut the flank steak in half, then season on all sides with the salt and pepper. Add to the pot along with the tomatoes, beef stock, wine, sugar, cumin, oregano, paprika, bay leaves, and garlic. Stir to combine all ingredients and bring to a boil. Lower heat to a gentle simmer, cover, and let simmer for about 3 hours, or until meat is tender. Use two forks to shred the meat, then add the olives and capers. Stir then let simmer 20 minutes, or until the sauce thickens. Stir the cilantro in at the end.